Nashville’s mayor has unveiled a $5.2 billion proposal for a 26 mile new light rail system in five corridors, with a 1.8 mile downtown subway segment. It would be funded by a half-cent initial increase in the sales tax, later boosted to a full cent, plus increases in the hotel and rental cars, and business and excise taxes. Bus upgrades are part of the program too. Building a system like this makes no sense in a city like Nashville. That doesn’t mean light rail would be an active bad for the city, but the gains will probably generate negative ROI, or at a minimum less of an ROI than many alternative ways to spend that kind of money. 1. 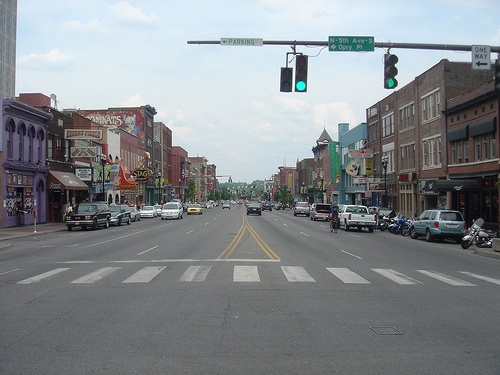 Nashville is a very sprawling city with highly dispersed origins and destinations of traffic. It lacks the gigantic downtown employment centers of New York or Chicago that are well-suited to transit. According to the very pro-downtown City Observatory, Nashville only had 143,000 city center jobs in 2011, about 21% of the region’s total jobs. That was for a three mile radius circle around the city center. This generous 28 square mile region is vastly larger than the typical definition of a downtown. Even with red hot job growth, this number would not have grown to a level to justify a major core centric light rail system. 2. Nashville is overwhelmingly a city designed around the car (low density, etc). There’s a very limited quantity of districts designed in a transit oriented way. Basic pedestrian infrastructure is missing in many areas. I might suggest creating 21st century streets that are humane for pedestrians and bicyclists would be the first priority, and a pre-condition of transit. Dallas, a much larger region and city, built a similar light rail system that has dramatically underperformed in terms of ridership. It certainly hasn’t been a game changer for the region’s transportation or development patterns. Central Dallas is doing well, but so are other cities without a light rail system. Many thousands of apartments have been going up in central Columbus, for example. Even huge and relatively dense Los Angeles has been unable to grow its transit ridership despite a massive investment in a vast rail network. 5. And don’t forget, comes with a large capital replacement tail. Agreeing to build something shiny and new is one thing. Finding the billions it will take to reconstruct just to keep it at end of lifecycle is another. Just ask Washington Metro riders. Even if the money is totally wasted, which it would not be, building a $5.2 billion light rail system still wouldn’t sink the city. But you’ve only got so much money to go around. At a 10.25% sales tax as proposed, Nashville would likely be tapped out here in terms of future tax increase. You’ve also only got so much management time and attention to give. Is this where you want to put your money and your time? This is a great example of interior cities being unable to transcend coastal definitions of what a “major league city” should look like. Nashville does need to reinvent its transport infrastructure for the modern area and to accommodate growth. It has the opportunity to do that in a way contextually appropriate to what it is. Instead, they’ve chosen to simply try to copy what Portland did way back in the day. Nashville, by not turning its back on country music but embracing it, showed how it’s done from a brand perspective. They weren’t afraid to be different from the coasts in ways that might be perceived as déclassé. They should find it within themselves to channel that same spirit when it comes to transportation. For further info see my reality check on rail transit paper from earlier this year. I’m generally a fan of rail. And I like limited rail projects even in places that might not be ready for them. But if Nashville spent 20% of that on dedicated bus and bike lanes and pedestrian improvements, holy cow. The livability impact would be huge. Certainly better than adding a train from nowhere to downtown. Talk to anyone that commutes in Chicago and they tend to take the bus more then the train, A bus takes you to a point closer to your work place. For a billion you could have high tech buses that have a 15 minute stop times, more routes and plain cloths cops to make sure they are safe. Dallas has over 100 miles on existing freight rights of way, not arterial corridors that are more conducive to transit usage. Nashville’s size puts it in the same ballpark as Salt Lake City, Portland, Charlotte, and Sacramento. All with major investments in light rail, though again, 25 miles is not that much and will only be a part of that investment. Yeah, I was going to say that comparing to Dallas’s light rail plan rather than Houston’s might be a mistake. I suppose 25 miles in a smaller city is a bit more like the sprawling Dallas plan than the focused Houston one, but arterial corridors (with a downtown tunnel) is much more like the Houston one than the Dallas one. I’m curious how one realistically resolves the chicken and egg question of transit in the CBD. Do you allow high-density development until it makes sense to build rail transit? Do you build the transit and wait for it to enable high-density development? Or do you just throw up your hands and write off New York, Chicago, etc as “legacy cities” that can never be reproduced in the auto era? To point #2, here’s another weird thing I’ve noticed about Nashville on maps (I haven’t been): There aren’t any bridges. A river runs through the middle of the city and I can count the number of points you can cross it (it looks like ten). Four of the bridges are expressways, and six of them (including two expressways) are downtown. On the west side it looks like you can go about five miles from the last bridge to the city limits and another five miles into the suburbs before you can cross another bridge. From Chicago it seems bizarre to me. I also can’t identify a single surface street that goes uninterrupted from one end of town to the other (maybe if you count Charlotte/Main/Gallatin as a single street). I don’t know how well a town like that would take to transit when there seem to be so many gaps in the basic urbanist fabric. Um, I think that Mr. Renn’s point is that you do throw up your hands and write off the legacy cities as things that will not be reproduced in the auto era. I think that even the folks over at Strong Towns would agree that trying to engineer a city to resemble the legacy city by making massive investments in underutilized infrastructure is a bad idea. The legacy cities developed during a time when granular, incremental development was the norm. That kind of development is largely forbidden today, and putting in light rail in a metro doesn’t change the zoning or building codes. Perhaps the first step would be to stop forbidding “granular, incremental development”? But first you’d have to explain what you meant by that term. It’s easy to say that, but the entire financial, fiscal, economic and planning system is predicated on certain ways of doing things-large scale developers only need apply. Prior to the “collapse” many speculate is coming, we are not going to change all of these systems in any comprehensive way. Granular, small scale, incremental development means- people can build on small lots with minimal setbacks, etc. People can subdivide large lots. People can build to the next level of intensity on a lot (i.e. a single family home can become a lot with two or three units of housing, a single story business can add a second floor for offices or an apartment, etc.). People can build with minimal or non-existent parking requirements. It especially means that people can do all of this by right, without the need to hire lawyers, lobbyists, etc. I am sure that I have left some things out, but I think this should be enough to illustrate what granular, incremental development means. The tough thing about getting rid of zoning and other attendant regulations is that greedy people take advantage of it. That’s how we ended with those terrible, overcrowded slums with windowless apartments. It’s a fine line. I’d agree that pendulum has swung too far in favor of zoning that minimizes density. Today’s parking requirements seem onerous, for example, but without such requirements you’d end up having visitors cram up residential streets with parked cars. There’s a fine line you have to balance. I agree that the pendulum has swung too far in favor of inhibiting density and organic development, but it’s also hard to envision what ideal zoning laws would look like. I would agree with you that it is hard to envision what ideal zoning would look like. Luckily, as you point out, it isn’t hard to envision better zoning than we currently have. Anyway, the point of the explanation about granular, incremental development was to explain why we cannot, in practice if not in theory, recreate the kind of walkable development that was common in the past. I agree that ped/bike/bus improvements would give a lot more bang for the buck and can be built incrementally while using the existing road network and encouraging gradual density. The truth is that most people don’t want to live in Manhattan. The good news is that you don’t need Manhattan densities to make transit work. You simple need to put the right tools in place for the right job. Name automobile-era cities in the United States that prove your rather blithe last two sentences. (Not counting university towns that have captive student populations). We have more than 20 four-year colleges and universities as well as six community colleges and 11 vocational and technical schools. At the least, if we can captivate these students, have them accustomed to public transit, and keep them here after university to invest in our city, it will eventually make a difference. New York’s system wasn’t adopted overnight, and neither will ours. It doesn’t mean we need to sit back and not progress. Isn’t it logical that the creation of rail would lead to transit oriented development? It’s not an unknown. We have seen other cities do it. Pockets of such development perhaps. Usually, though, Nimbyism kills major high density development, and a city like Nashville oriented around the car will always prefer more low density development. Even after 35+ years, SF BART has inspired high density development near only a few stations. Others saw low density frozen in the zoning (North Berkeley BART). Transportation investment is best understood over the long term. That’s what makes it so hard to create and sustain. New York’s vast web of rail, like Rome, was not built in a day. Well, Ottawa (pop. 1.4 million) is a little bit more transit-oriented, but it is currently building an LRT system with a 2-mile downtown subway. Total cost of the first two phases is $6.6 billion Canadian, which at the moment is about $5.3 billion US. Seems like a pretty similar project by any measure (and Ottawa already has a 5-mile line that has been operating for 10 years.) The ROI is already massive, with many billions of dollars of development planned or under construction along the line. The fact that a city is car-oriented is not an argument against building higher-order transit. The only way to start to change that is to get the transit in place. Transit-oriented development does not occur based on vague promises of future transit improvements. It also doesn’t occur around bus transit. In the Ottawa example, the LRT follows the route of bus rapid transit lines that have been in place for decades. It spurred almost no development. The LRT has changed that dramatically. Most of the comments in this post are based on where Nashville is today, what it looks like today. The author doesn’t seem to allow for future development and growth that brings Nashville more in line with the conditions that he identifies as missing. The corridors that the lines are planned for, will see extensive growth in density. Nashville cannot plan for the future without a robust transit system – one that will help to reorganize the city around its primary arteries with development that is more self-sustaining and doesn’t require the car for every errand. The mayor’s plan calls for significant improvements to the bus system. Also, each of the arteries where the transit lines would be located would see the needed improvements that the author mentions. A complete street approach would be the end product on each of the pikes designated. There is a very healthy understanding that a healthy, successful transit system isn’t possible without healthy pedestrian, bicycle environments. All of these elements will be part of the transit plan. Nashville has allowed itself to sit and let the city develop around itself – without being proactive in transit and overall planning. Moving towards a robust transit plan as provided by the mayor allows this great city to move in directions it should have embarked on 20 years ago. That’s what the Mayor’s plan does. Is the land in the corridors around where the lines are planned for already zoned for building and redeveloping land densely as of right? If not, as a citizen I would be very skeptical that the land will be rezoned after the funding for the transit system is secured. The transit plan may well be a good one, but I doubt that it achieves its aims or is worth the money if the land is not rezoned first, as a precondition to the commitment of public money for the transit infrastructure. Again, that is not to say that the plan is a bad one, but is to say that if the rezoning doesn’t happen first, whoever is doing the planning is planning to fail. Much if the zoning along the corridors is commercial for the first 3-4 lots. Nashville’s planning department created a 25 year plan called Nashville Next. This plan does Call for greater density along these same corridors. Quite a bit of rezoning will be required to accomplish this. We do have a strong nimby culture but it isn’t as present along these urban corridors. I’m curious where you live and if you’ve visited Nashville before. We have our challenges but we have no choice to move forward. I wouldn’t be surprised if some of the corridors end up as bus rapid transit instead of light rail. To get this rolling, we need to start with light rail because it makes the entire plan more sellable. How does starting with light rail make the entire plan more sellable? About 3 years ago, a BRT system was proposed for one of Nashville’s busiest thoroughfares – Harding/West End/Broadway. It would have dedicated lanes and all the works. It would have operated like a streetcar except it was in the form of a bus. There were many objections to the plan (I thought it was great and wish we had it today), one of them centering about the use of buses. Even those opposed to the plan would remark, “well if it was light-rail or a street-car, I would support it.” Buses carry an unmerited stigma in Nashville. It wasn’t seen as bold enough. In order for this plan’s projected budget to be approachable by the public, it needs to be bold and look and work like a serious plan. A system based on rapid bus/bus rapid would not have the same cache. That may seem absurd – but that is the reality. I can’t imagine Portland had a bigger downtown than Nashville has now? I guess there are obvious differences in culture and political spectrums but I could see this working long term. I think you need to think about the tourism aspect. I know Cincinnati’s street car has been underperforming during the weekdays but the weekend is bolstered by tourist in the city. (Cincy has seen an increase in tourism since its downtown revitalization) I personally appreciate a city that’s willing to make an investment that they are forced to deal with in the built environment long term. There’s no getting around it and it will be in the publics eye wether they like it or not. I do see an issue with the low destiny in the surrounding neighborhoods from Nashville’s downtown. I’d assume they would have to rezone a lot of these places, or there could be high density corridors along the lines similar to Woodward ave in Detroit or High street in Columbus (no rail). I’m still very hopeful for the long term effects. Just trying to compare Nashville to other cities. The problem I have with all this, every single comment is it fails to acknowledge the gorilla in the room, the Music City Star. We’re not speculating on the future of Nashville. We had the future of Nashville built and it’s been going for over a decade. The Music City Star hands down, inch for inch, is the single worst – aka least used – rail line in the nation. In fact, it’s such a stinker that the next worst does twice as well! There’s not a single TOD that’s been built by any of the stations. Nada, zilch, bupkiss. I know, I know, que up the excuses for it, explain how the colors in the logo weren’t right, etc etc. The reality is that Nashville isn’t a city that’s built for the HIGH VOLUME MASS TRANSIT that is the way LRT has a chance in hell of making sense. It’s not and shown absolutely zero ability to do so on it’s rail line. BTW – As Mr. Renn points out, this maxes out Nashville’s sales tax potential. And it does it for the next 50 years. This is a hugely fragile venture. It’s the sort of grand, swing for the fences and mortgage the grandkids’ future that org’s like Strongtowns speak out __AGAINST__.